Weather conditions can promote or inhibit bad smells in an urban area. Warm weather can increase bacterial decomposition of organic matter, which under certain conditions can produce sulfurous smells – this is why it often reeks when you walk past sidewalk garbage bags in summertime, yet you rarely notice these types of smells in winter. An atmospheric inversion – meaning an absence of normal daytime vertical mixing of the atmosphere – can trap pollutants near the ground. The conditions during New York City’s 2007 Big Stink episode that I wrote about last week fulfilled both these requirements. The temperature of 72 °F in Central Park on January 6th, 2007, broke the previous record for that day by an amazing 9 °F. In our editorial, we explained how this event likely warmed polluted coastal marsh water and sediments, increasing bacterial respiration and sulfur emissions. It was a long duration of warmth – the temperature over the eight days leading up to the event averaged 51 °F, with an average daily high of 57 °F, an exceptionally warm weeklong period for January. As shown above, a warm front was in the vicinity of Manhattan on Monday, January 8th, between 7 and 8 AM, as first explained by David Wally of the National Weather Service in Upton, NY. This “warm front” was the ground-level intersection of the top of a northward-moving wedge of cold air. Within such a wedge, there are often inversion layers that can hold pollutants or other foul-smelling compounds close to the ground, by reducing vertical atmospheric mixing. Fog layers, often visible as you drive along a highway in the early morning, are small-scale inversion layers that are made visible due to the moist fog. The weather system passed through the area by noon, strong winds blew from the west, and any foul smells were cleared out. Wind vectors (arrows) above show the direction and speed (arrow length) of winds for three different time periods at several sites on the morning of January 8th, with the wind vector key at the bottom right (5 m/s is roughly equal to 10 mph). 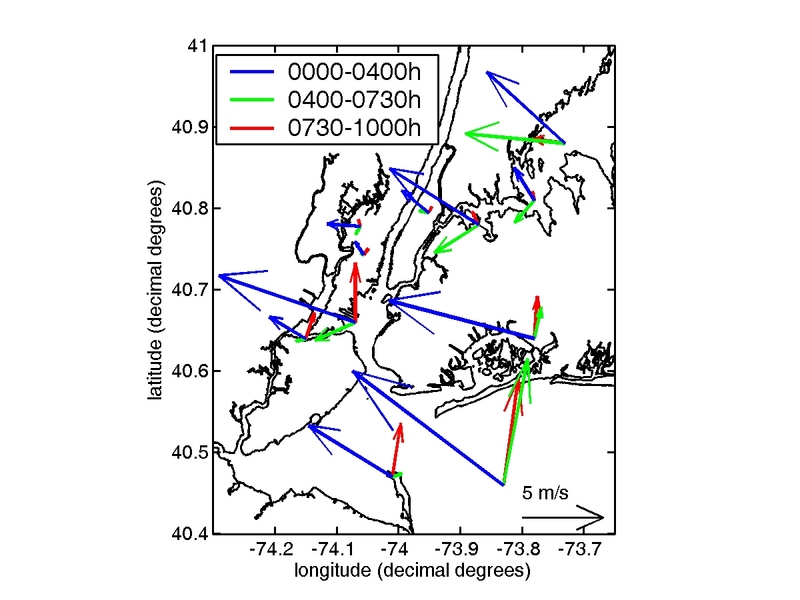 The winds follow a clear pattern where winds blew from Brooklyn (including Jamaica Bay) toward Manhattan between 00:00 and 04:00 hours the night before the big stink. Then, the winds from 4:00-7:30 AM is that the vectors (green) show a shifting wind pattern suggesting a passing warm front, with northeast winds in the top left and center of the map, and south winds to the lower right. However, there are two reasons why this does not necessarily implicate Brooklyn as a source: (1) strong winds (~20 mph) are not consistent with a low-lying atmospheric inversion and concentrated stink plume, and would more likely mix up the lower atmosphere and disperse bad smells. (2) The complaint map I posted last week shows that the east side of Manhattan was lacking bad smells, further suggesting Brooklyn was not the source of the smells. The stagnant or south winds from 7:30 to 10:00 AM from Staten Island and the Jersey Shore northward to Manhattan are more likely identifying sites that could have been the source of the stink. This air would travel along the coastal corridor of salt marshes, from northern New Jersey to Staten Island, and could easily deliver foul smells from coastal marshes and the Fresh Kills former garbage disposal site. Unfortunately, “source attribution”, in cases where winds are relatively light and variable, is a can of worms, and this is where my research on this topic ended. I hope to take this question back up with high-resolution computer modeling of atmospheric flows around the New York City region, as part of my job as a post-doctoral research scientist at the Stevens Institute of Technology. However, to the best of my knowledge, this cross-river whodunnit was never solved: Was it New Jersey’s stink or New York’s? This entry was posted in air pollution, water, weather and tagged Manhattan, maple syrup, mercaptan, natural gas, new jersey, New York City, pollution, rotten egg. Bookmark the permalink.